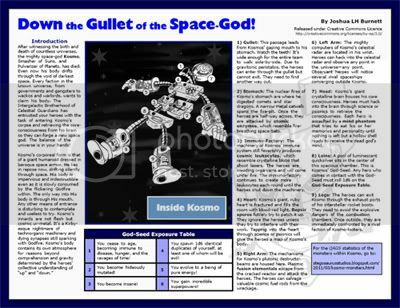 Stegosaurus Studios: Down the Gullet of the Space-God! "Down the Gullet of the Space-God!" is done, and you can download it here. As per the contest rules, there are no game stats in dungeon, but you can see the QAGS stats for the critters here. This has been a fun exercise. I found out about the One Page Dungeon Contest yesterday and was immediately intrigued. I've written many, many adventures of the years, and it was a fun creative challenge to come up with something unique and new and fit it all on one page. It all came together pretty quickly. First, I glanced through the past years' entires to see what kind of things other people were doing. I knew right away I didn't want to make a classic underground fantasy dungeon. Something in space perhaps? I liked that idea, but I didn't want to do the old "abandoned space station" or "starship overrun by alien monsters" thing. Then I remembered an adventure Ian Engle ran a few years ago where our troubleshooters were crawling through the body of a dead angel under lake Erie. "Hmmm..." I thought, "Giant space god? Something like Towing Jehovah with Galactus?" Rather quickly, I had a sketched out a thumbnail of the "dungeon" inside a space god. I was pretty happy with it. "Now, I'll just type out some quick ideas then move on to other projects.I'll come back to this later," I said to myself. The next thing I knew, several hours had passed by. I had a complete text written and I was moving on to layout. Again, this project has been big fun, and I look forward to dong more of this sort of thing. If any of my game-designy friends are reading this (and why wouldn't you be?) I encourage you to go tot he One Page Dungeon page and enter the contest. This reminds me--just a little bit--of an old Lost in Space episode where they had to go inside the giantized robot. Yeah, it was campy. Oh hey, I do remember that episode. I think I was also influenced by a Tom Baker episode of Doctor Who where the Doctor and Leela had to go into the Doctor's body (using clones) to fight a sentient virus. Ack! Another contender for the "best alimentary tract dungeon prize!" Great map and a neat design. Good luck!